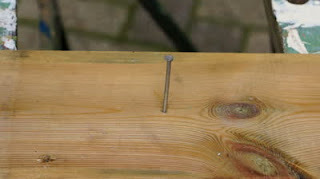 With some woodworking lessons comes some real life lessons Desiderius Erasmus has said, "A nail is driven out by another nail. Habit is overcome by habit." We should not simply resist "bad habits," we would do better to create good ones. A teacher who was lecturing on habits told his class that "anything you repeat twenty times is yours forever." From the back of the classroom came a whispered voice, "Mandy. Mandy. Mandy. Mandy..."
What the teacher was trying to say is that any behavior, often repeated, becomes habit. And any habit often repeated, becomes stronger and more powerful. Which is why Dr. E. Stanley Jones was so wise in admonishing us, "Since habits become power, make them work for you and not against you." In other words, drive out the undesirable nail with a good one. One woman did just that after lamenting to her friend, "I hate being late. It has been a problem for me all of my life." "Do you really want to change that habit?" her friend asked. The woman said that she did and her friend responded, "All right. Every time you are late for work or anywhere else, you must give me $25." "I would go broke!" came the reply. "But I will do $10." It has to be a large enough amount of money for it to hurt," said the friend. "Believe me, that will hurt," the woman replied. They agreed that the money should be deposited in a jar and used for charity. In the first week the habitually tardy woman only paid $10 to her friend. The next week, $20. The third week none at all. By the fifth week she had built a new habit that changed an irritating pattern which had hindered her all her life. She drove out one nail with another one, and in doing so she found freedom. Behaviors, as well as attitudes, often repeated, become strong habits. And great freedom is found in replacing that unwanted way of acting or thinking with one you choose. Today why not start that habit of reading your Bible each day? By doing so we will see what great things God has in store for each of us. Dear Lord, we pray that we would take a look at our life and replace the bad habits with things that are good and fruitful. In Jesus’ Name, Amen.